The Yaris has always been an important car for Toyota, and so with the introduction of the latest model they’ve sought to ensure they maintain the strengths of their most popular car. They’re also introducing technology to tempt in new buyers and to reassure current owners in the hope of tempting them to buy another Yaris. The B-segment, or supermini, marketplace into which it falls is the biggest market in Europe, with the likes of the Ford Fiesta, currently at the top of the sales charts in the UK, and the Volkswagen Polo amongst the rivals. So the new Yaris is up against stiff competition, and, keen to promote their latest third generation model, Toyota invited us to take a tour of the factory at which the new car is built, in Valenciennes France, as well as offering us the opportunity to explore the cabin and new technology first-hand ahead of the full launch later in the month. The ‘buzzword’ of the DAY was “quality.” After the trouble they had with the unexpected acceleration recall back in 2010, Toyota are obviously keen to put minds at rest and encourage customers that their longstanding reputation for safety and reliability is well placed and still stands. To that end the new model is checked thoroughly at many stages along the production line. Keen to stamp out any defects, no matter how minor, as soon as they are spotted, anyone who works the line is permitted to halt it entirely at any time if he or she identifies what could be a problem. The attention to quality extends beyond the production line, too. 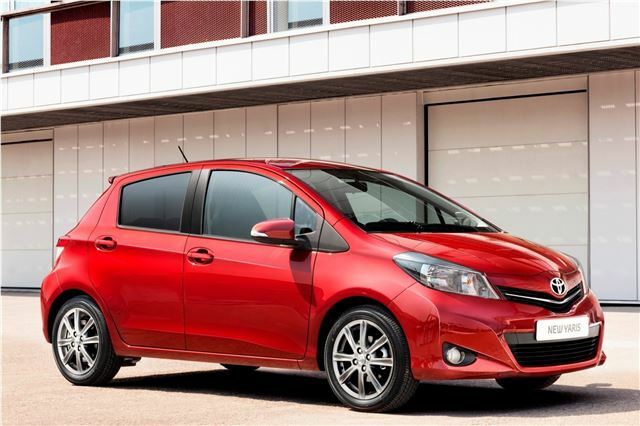 The development period for the new Yaris was 3-years, while the development period for the previous model was 1.5 years. Special attention was paid to ensuring the parts suppliers were of the highest standard and provided the best quality parts. It’s safe to say the new model is improved in every regard over the outgoing Yaris. Every surface, internally and externally, looks and indeed feels much better. There are soft touch dashboard materials extending into the doors, and gone is the quirky and low-rent looking centre-dial arrangement of the last generation. Instead there is a handsomely styled conventional instrument cluster which sits behind the steering wheel, where you’d expect it to be. But it’s not all good news. The top of the dashboard, door linings and lower part of the centre console, while pleasantly textured, aren’t made of a particularly thick plastic, and they flexed under any pressure, more so than the likes of a Hyundai i10, a much cheaper car. Similarly the cup holder divider isn’t exactly what you’d call pleasantly well built. However all is not lost, the interior is spacious for a car of this size, with ample rear knee- and head-room, a drivers arm rest, decent upholstery and driver focused, ergonomically located major controls. And then there is the piece-de-resistance, the new Toyota Touch infotainment system. This touch screen system is standard on all but the most basic specification and features Bluetooth, reversing camera, and multimedia controls as standard, and for a fairly modest fee of around £500 it can be upgraded to Touch&Go, which provides the same functionality along with satellite navigation which can be linked to Google Maps via your telephone. It’s a very well thought out system that’s easy to operate, and when paired with a suitable telephone it allows users to connect to the internet. Pairing to a Bluetooth enabled phone is extremely simple, too, so anyone can do it. Unfortunately we were unable to take the new model out on the road, so it remains to be seen if it rides, goes and handles as well as the best of its rivals, but we’ll bring you a full road test soon. Prices for the new model have been released and start at £11,170. For more details on pricing and specification click here.